If you follow my blog, a couple of days ago I published an article about the pros and cons of Transitions. I had mentioned that “Transitions” is actually a specific brand of photochromic lenses. There are other brands, but for many people, transitions have just become the norm to call photochromic or light adaptive lenses. If you haven’t gotten a chance to check it out, you can find it here. For the rest of this article I will be referring to photochromic lenses as a whole as Transition lenses, just to make it easier. So I understand that buying glasses can be confusing all in itself, but buying glasses online just adds to the confusion. Especially since every single website is built differently, and therefore more confusion. So what I did was I went through all the different retailers and took a look at what each one was offering when it came to Transition lenses. What I was looking for a place that could provide you with a complete package with, a polycarbonate lens, with anti-reflective coating, as well as Transitions. What I didn’t include in this is the cost of the frame since the choice of the frame can be such a huge variable when it comes to the price. This benefited retailers that had frames priced with “free” lenses included. The retailers aren’t listed by best price, but by best value that they could provide, whether that be their frame selection, overall service, or value. These retailers can provide an overall great buying experience, Take a look below. Warby Parker is my pick and only because they are one of the few retailers who has solved one of the biggest problems of buying glasses online, the ability to try on the frames before you purchased them. Their home try-on program offers you the ability to pick out 5 frames and have them sent to you free of charge to try on for a week. After you made you pick you can send the frames back and make your pick on their website and they will start working on your glasses before their frames even get back to them. Warby Parker doesn’t carry and designer eyewear, but they’re in-house frames that they have are really high quality and do not feel cheaply made. You can check out my full review of the home try-on program here. At Warby Parker, their frames come with polycarbonate lenses with anti-reflective coating. So in order for you to add photochromic lenses, the cost is just an addition $100. Not a bad deal at all, and if you want thinner and lighter high-index lenses it’s only an additional $30. When you are looking for a range of different types of photochromic lenses, this is your place. Although all of the photochromic lenses that are from the Transitions brand, they carry the Transition Signature. XTRActive, Vantage, as well as Drivewear. So you have many options to choose from there. They also have a decent selection of frames, if you are looking for designer frames, this is a good place to look at. At Eyeglasses.com if you were to get polycarbonate lenses with an anti-reflective coating as well as Transition Signature VII lenses, the cost of the lenses comes out to $203. If you want the Transition XTRActive it is an additional $20, Vantage an additional $40, and Drivewear an additional $50. It is honestly extremely hard to beat the price for photochromic lenses from Zenni. Zenni is an online optical retailer which has made a name for itself by providing quality eyewear for their customers at low and affordable prices, with photochromic lenses, it is no different. They don’t carry any designer eyewear, but their selection of in-house frames is just gigantic. You are sure to find like 5 frames you are going to want, it’s too bad that they don’t have a home try-on program. For their polycarbonate material, they carry Vision-Ease LifeRx photochromic lenses, which you are able to get for just $66 if you add on their anti-reflective coating it is an additional $4.95. Which means for $70.95 plus the cost of the frame you choose, you can have a polycarbonate lens, with photochromic, and anti-reflective, you really can’t find a better deal than that. If you are looking for designer eyewear, SmartBuyGlasses is the place to go, they carry a huge selection of designer eyewear that consists of over 180 different designer brands. This includes brands such as Oakley, Ray-Ban, Versace, Giorgio Armani, Vogue, and much more. The one thing about SmartBuyGlasses is that they do not have polycarbonate lenses as an option. So if you are looking for polycarbonate lenses you would have to look elsewhere. But, they have a great deal for transition lenses that are 1.61 high-index. You may be thinking well isn’t high-index better anyways? Yes, but it isn’t as impact-resistant as polycarbonate, therefore if someone were to need the impact-resistant factor, high-index wouldn’t do. If you need thin and lightweight lenses then this is the place for you. You can get the 1.61 thin high-index lenses with Transition Signature VII photochromic lenses for $138. That is an amazing deal as most places that sell high-index lenses with photochromic will charge you over $200. EyeBuyDirect – Over at EyeBuyDirect, you can get a polycarbonate lens, with anti-reflective coating with their in-house photochromic lenses for $101.90. If you are looking for Transitions brand lenses, you can get polycarbonate lenses, with anti-reflective coating, along with Transitions Adaptive, it would cost you $159. 39Dollarglasses.com – The cost over at 39DollarGlasses.com for photochromic lenses was quite affordable as well. If you got a polycarbonate lens, with anti-reflective, and transitions signature it would cost $123.85. No designer frames here just their in-house glasses, and Zenni, EyeBuyDirect, and Warby Parker have better style frames. 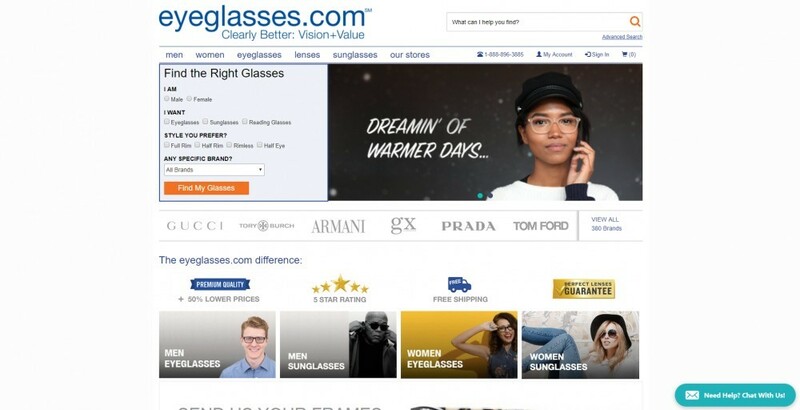 FramesDirect – FramesDirect has a huge selection of designer eyewear and over 200 brands for you to choose from. If you were looking to get your photochromic lenses here, getting a polycarbonate lens, with anti-reflective coating, as well as transition would cost you about $313 from FramesDirect. So they are more on the expensive side, but they run some great promotions all the time for their lenses. GlassesUSA – This is the place to look if you are looking for wild cat-eye frames or the new trendy geometric frames. If you were to get photochromic lenses here, a polycarbonate lens, with anti-reflective coating, along with Transition Signature VI it comes out to about $198 for the lenses. Target Optical – Target optical is another retailer that you can find a great selection of designer eyewear to choose from. If you are looking to get photochromic lenses, you can get a polycarbonate lens, with anti-reflective coating, and Transitions for $210. Eyeconic – Eyeconic is the official online optical store for VSP Vision Insurance company. They offer you an easy way to be able to apply your vision benefits online if you are a VSP, MetLife, or Cigna Vision member. They have a nice selection of frames to choose from, and if you are looking for photochromic lenses. At Eyeconic you can get polycarbonate lenses with an anti-reflective coating and photochromic lenses made by SunSync for $131. GlassesShop.com – Glassesshop is another website that carries trendy and stylish in-house made frames with a ton of different styles to choose from. If you get photochromic lenses from here you can get a polycarbonate lens, with an anti-reflective coating, and photochromic lenses for $130.85. If you want Transitions brand photochromic you can only get it in 1.61 High-Index. There are many benefits to having lenses that adapt to the environment that you are in, and can help provide you with a comfortable viewing experience in bright sunlight. Here are some of my favorite benefits of having Transition lenses. UV Protection – The most obvious benefit of having these lenses is the constant protection that your eyes get from harmful UV rays coming from the sun. This benefit is more important if you are using any other lens material other than polycarbonate as polycarbonate already has 100% UV protection. Glare Protection – Since this lens automatically adapts to UV rays and darken when exposed to them, they reduce the eye strain you would normally get from the various source of glare outdoors. Since the lenses darken gradually many times you won’t even notice that everything has gotten darker, to me personally I feel as if someone had turned the brightness down on the sun. This, in turn, provides you with sharper, crisper, clearer vision. Versatile – One fo the biggest benefit of these lenses is the fact that you can wear them in any environment. They are designed for you to be able to wear all day, whether you are indoors, or outdoors. The versatility allows you to go about your day without having to carry along multiple pairs of glasses. Great For Children – It is a fact that children’s developing eyes allow up to 6 times more UV light to penetrate their eyes than adults. Children tend to have more active lifestyles and alternate between indoors and outdoors often, therefore having transitions would be beneficial to protect those young eyes. Blue Light Protection – Transition lenses have always blocked out some of the harmful blue light that you encounter throughout the day. Whether you are indoors or outdoors they offer some blue light protection over standard clear lenses. Well there you have it, some great places to purchase Transition lenses if you were looking for them. Many great retailers you can visit to see if you can find your next frames. Do you use Transition lenses? Do you like them? Why or why not? I would love to hear from you. As always if you have any questions, don’t hesitate to leave them below and I will get back to you as soon as I can. I am currently trying to buy a light adaptive lenses I have problem with my left eye due to long exposure to rays of light from my phone’s, I have tried different types of glasses but none seems to work but I believe that is over thank God I stumbled on your site now I know where to purchase the right glass for my eyes I will be ordering from warby Parker this week for my lights adaptive glass, thank you so much for the article, it is really helpful. Thanks for the article; it comes at a perfect time for me. I’ve been considering buying glasses online, but had not quite decided. One of the things that kept me was wondering how the frames can be fitted correctly, but reading your article has steered me in the right direction. One of the places I’ve heard about is Zenni, but after reading your review, I’m leaning towards Warby Parker, given the try-at-home program; that may work well for me. Hi there Hugo, thanks for stopping by! Yes the home try on program can be quite helpful when picking out your glasses online. It is truly an innovative program and helps solve a big problem with buying glasses online. I have transition lenses on my current pair of glasses and I love them! They give extra protection from UV whenever I need it. And when sunglasses are too dark to wear I have my transition lenses to protect me from UV. Also do you know that most transition lenses have built it anti blue light filter? They protect you from the dangerous blue light from computers and mobile phone screens! They are worth to spend on! You should try it if you have not yet!